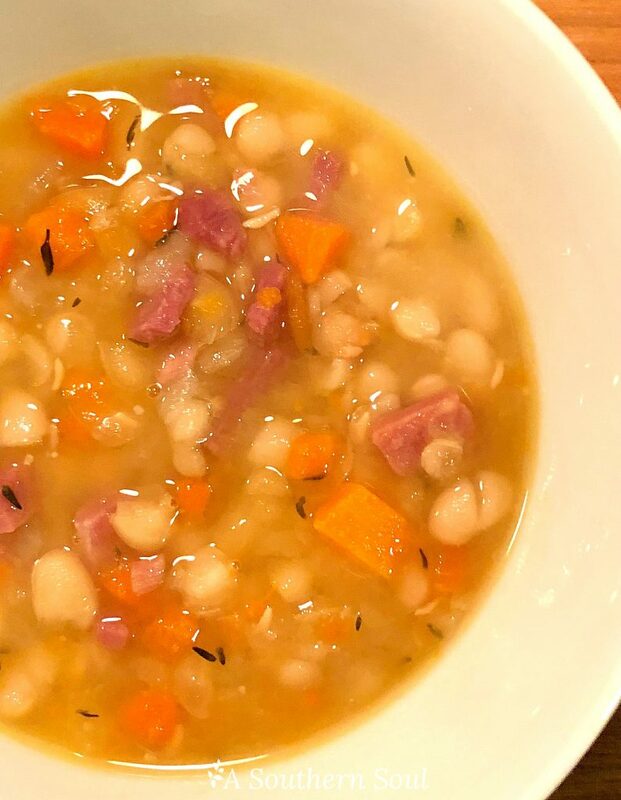 Tender, white beans, ham, along with a few veggies, good stock and herbs make a soup that’s hearty and satisfying. 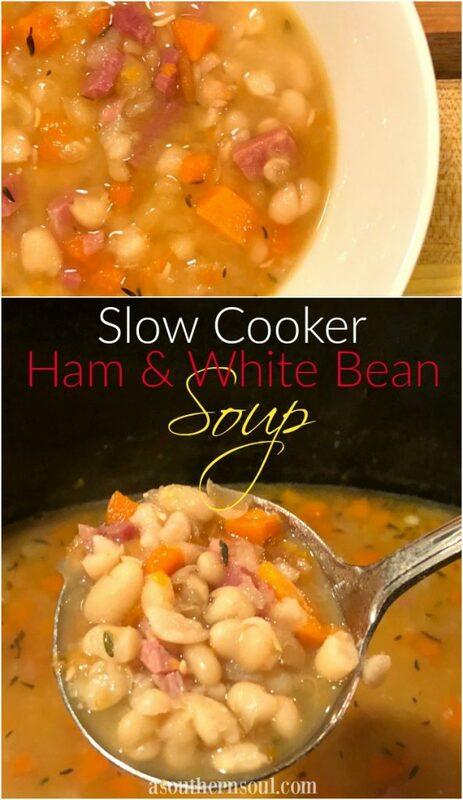 It’s a great, no stress meal on it’s own especially when the slow cooker does all the work for you! Load up your crock pot and you’ve got an amazing dinner that the whole family will love. According to those who know, this soup is the best I’ve ever made. Uh, really? Yes, that was my response. Not that I’m ungrateful or anything but this new dish came together so quickly that I hardly thought it’d be in the “best ever” category. The incredible part of the recipe is that it’s made with leftovers and simple pantry ingredients. In our house, we all love leftovers. That’s where the ham comes in. I always make a beautiful ham for Easter, Thanksgiving and Christmas and this year was no different. We were able to get quite a few yummy sandwiches from the leftovers then what was left was the tender, juicy meat next to the ham bone. There was no way that I was going to throw all that deliciousness out, so I got my noggin working, shopped my pantry and decided to make soup. 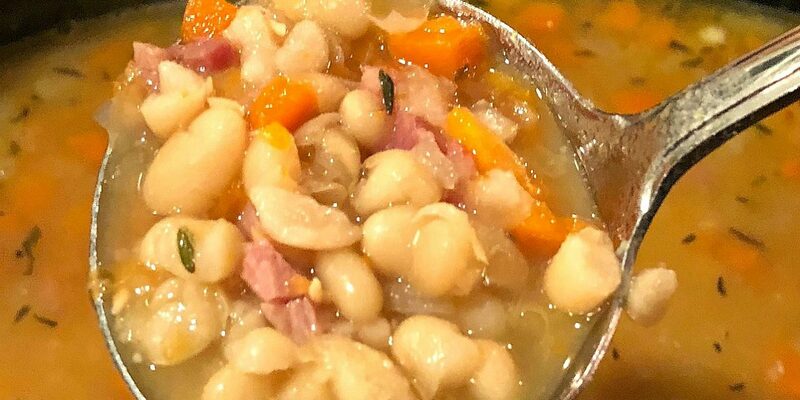 Since I had a busy schedule that day, I knew using my slow cooker would be best for helping get a hot dinner on the table plus guaranteeing that my dried beans would be cooked. I put a bag of Goya navy beans along with the chopped ham into my crock pot. With the addition of sauteed carrots, onions, garlic and my homemade stock, all I had to do is add a little water and some seasoning. Six hours later, I had the “best soup” I’ve ever made. I’m still not sure about “best ever” but then again, I’ll take it. No arguing here. 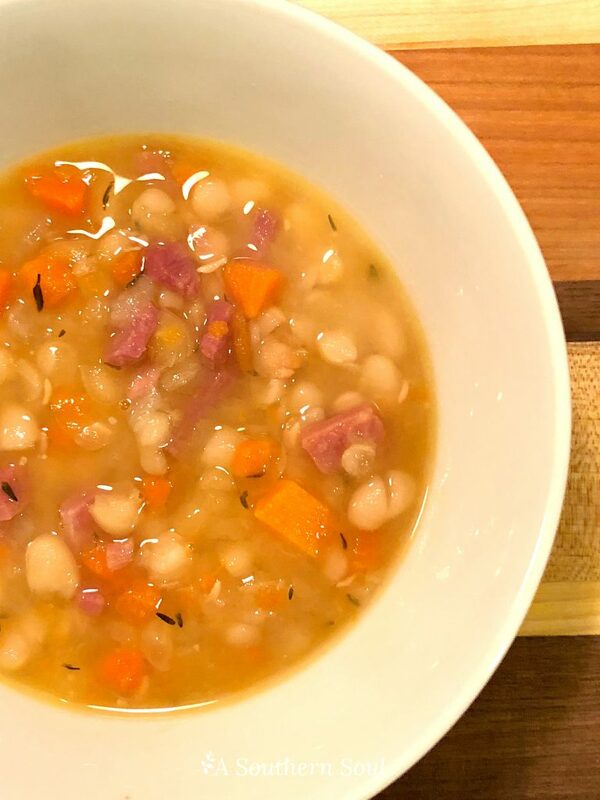 A hearty soup that's made with yummy leftover ham, simple pantry ingredients and a few seasoning. This is how to stretch your food budget without sacrificing taste! 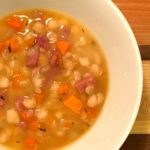 Place beans, ham, stock and water in crockpot. Heat olive oil in a small skillet. Add onions, carrots, garlic and cook until tender. Add salt, pepper and thyme. Stir and cook for 1 minute. Add all ingredients to crock pot. Place lid on and set to cook ON LOW/6 HOURS (check for tenderness and cook longer if needed), ON HIGH/4 HOURS. When done, serve hot with a dollop of sour cream and or hot sauce. Please see this featured recipe and more at Weekend Potluck! 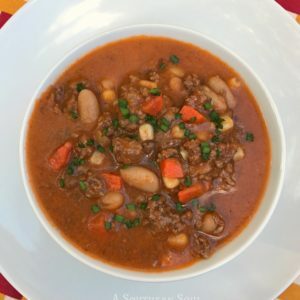 This recipe is also featured on Whatcha Crocking Week! Thank you for a recipe that’ll get rid of the rest of this Christmas ham. Looks yummy. Good meal also for right now since we’re going through a freeze down here on the Mississippi Gulf Coast. Happy New Year! Girl, I’m right there with you! 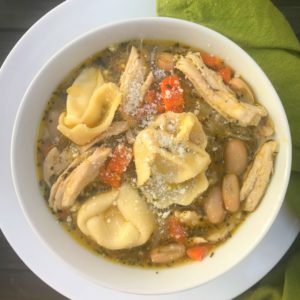 It’s 29 here right now and this soup is just what’s needed. I hope you like the recipe. My guys loved it and my son actually ate it for breakfast the day after making it! Have a great 2018, Pamela! Awesome, Jodi! I think you’ll really like it. 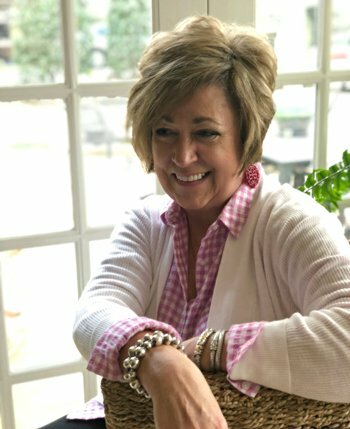 Thank you so much for stopping by A Southern Soul. I hope you’ll keep coming back. In the slow cooker right now. We will enjoy this with cornbread tonight.. Thanks for sharing this wonderful recipe. WOW! You are so welcome, Christine. 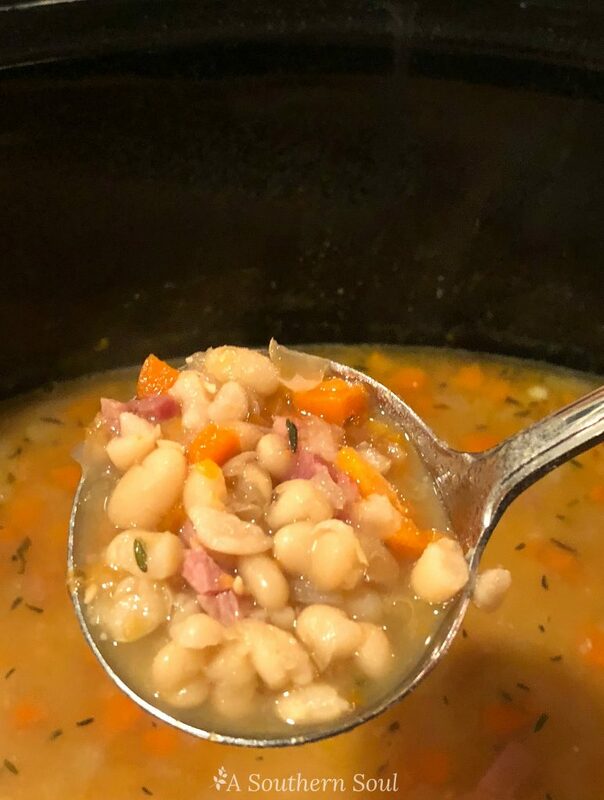 Thank you for sharing and I am so thankful you like this recipe. Keeping on coming back to hang out with us…it’s always more fun with friends. Thanks Maddy! Hope you like it. Do you need to soak the beans overnight? I do not Mary. Make sure you use the small beans though. They cook beautifully without soaking every single time. 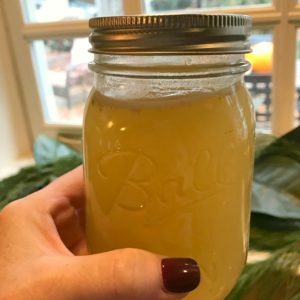 Thanks for stopping by and please let me know how you like the recipe. This is a favorite recipe of my sister Deb and I, It also freezes well, which is good because this recipe makes a lot. Don’t leave out the red pepper flakes or the garlic, that’s what gives this recipe a kick. As a suggestion, I usually use 2 tsp of Herbes de Provence instead of the separate herbs (or if you prefer use 1 tsp Italian Seasoning Herbs). Whatever way this stuff is addictive. And if you’re in a hurry, just rinse and dump a can of cannelini or great northern beans instead of the LONG cooking method! OOps, that’s 2 tsp Italian Seasoning Herbs! Sorry, fat fingers. 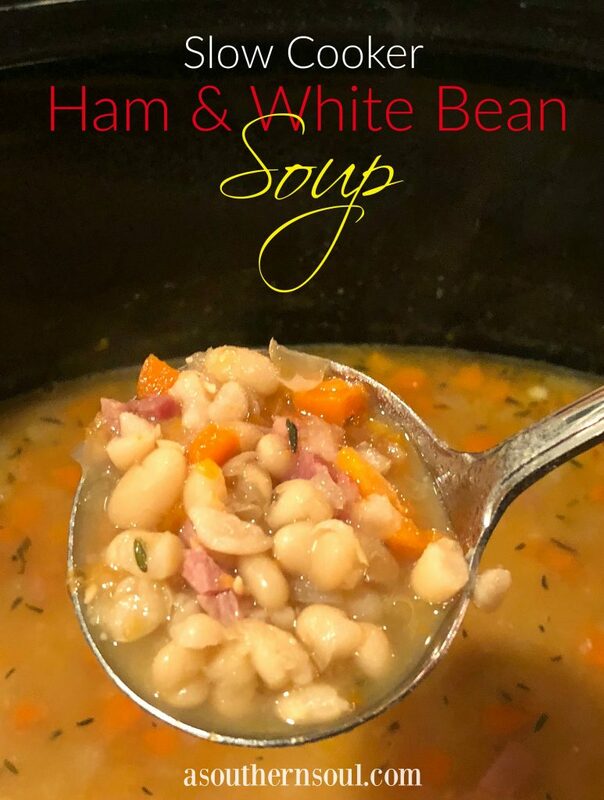 Mmm I love ham and beans and this looks perfect for this time of year! Hi — Would diced Country Ham work in this? Or would it be too salty with the Chicken Stock? Hey Joe! I think country ham would be too salty. You can use ham steak like you get in the grocery store. Just dice it up. I hope this helps! Yes, it does help a lot — THANKS!